From Nov. 21st, 2017 to March 2018, the museum’s temporary Hot off the Press: Seen in the County Papers exhibit will look behind the headlines to the men, women and changing technologies that have brought Huron’s weekly papers to press for over almost 175 years. In this Remembrance Day post, Sinead Cox, Curator of Engagement & Dialogue and curator of the upcoming exhibit, examines the life of one Huron newsman who was also a veteran of the First World War, and follows the story of his return from service via mentions in the local weekly papers. From my research into Huron County’s newspapers, it’s clear that a lot of effort, long hours and personal sacrifice often went into putting a paper to press and ensuring the latest edition reached local subscribers’ doorsteps on time. There were few excuses that could justify a late paper on the part of its proprietors: perhaps broken equipment, the precedence of a contracted print job (ie printing election ballots), adverse weather, public holidays, or even the rare editor’s vacation. 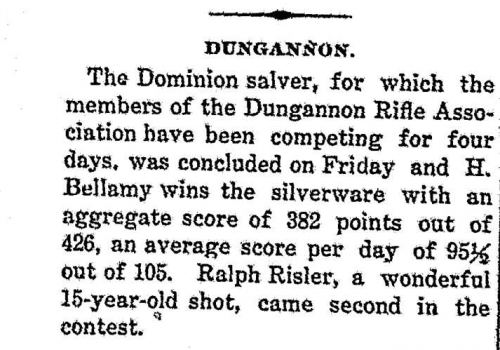 One of the most notable reasons to stop the presses, however, occurred in 1916 when The Dungannon News ceased publication entirely because its editor enlisted to serve overseas with Huron’s 161st Battalion. Born in 1891 in Blanshard Township, Perth County, Charles Arthur Harold “Harry” Bellamy had moved to Huron by 1908 when his step-father, Leslie S. Palmer–a former staffer at the St. Marys Journal and owner of the Wroxeter Star–founded The Dungannon News. His sisters, Amelia and Luella Bellamy, also worked locally as operators for the Dungannon telephone office. When his mother and step-father moved to Goderich in 1914, Harry became both editor and publisher of the News while still in his early twenties. As editor, H. Bellamy strongly supported Canada’s involvement in the Great War within the pages of his publication, and by March of 1916 had decided to enlist himself. At only 24 years old, and a newlywed of less than two years with his wife, Annie Pentland of Ashfield Township, Editor Bellamy signed up to serve with the Canadian Expeditionary Forces at Goderich. 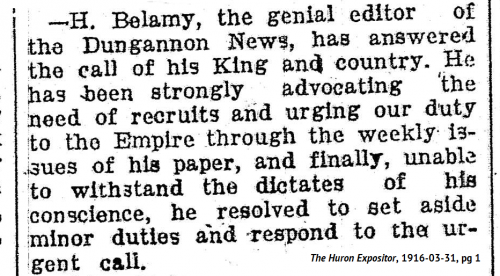 With the departure of its proprietor, The Dungannon News merged with Goderich’s Tory weekly, The Star, and the newsman became the news as fellow editors praised Harry Bellamy’s decision in the columns of their papers. Assigned to the 58th Battalion in Europe, Pte. Bellamy appeared once again in the pages of the local weeklies through his letters from the front. Stationed “somewhere in France” on Dec. 26th, 1916, Harry wrote to his friend F. Ross of how his “three or four days’ trench life” had begun with digging out a trench collapsed by shell-fire; he had become accustomed to ducking down for enemy fire “no matter how deep the mud and water is.” While evading sniper bullets in a no man’s land crater, Bellamy says he pretended he was at home, practicing with friends at the Dungannon Rifle Association. Although he was writing for the local papers, Pte. Bellamy was not able to regularly read them in Europe, and complained that the delays in mail also prevented him from keeping up-to-date with happenings in Huron County. According to his service records, a year after he had enlisted at Goderich, Harry fell ill with trench fever–an infectious disease carried by body lice. He left France for treatment in the U.K., and after complaining of pain in his limbs at York County Hospital, doctors at the King’s Red Cross Canadian Convalescent diagnosed him with myalgia (joint pain) and an abnormally fast pulse. Unable to resume his duties as a soldier, Pte. 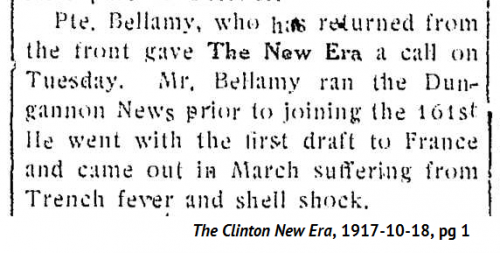 Bellamy returned to Canada, where in addition to his persistent trench fever, he received a diagnosis of neurasthenia–a contemporary term broadly used for nervous disorders. After his homecoming, he reappeared frequently in the local news columns, usually receiving mention for promoting the war effort at local patriotic events or canvassing for Victory Loans. Other brief news items hint, however, that although Pte. Harry Bellamy had returned home to Dungannon, he had not left the trenches entirely behind. He received treatment at a London hospital in early 1918 according to The Signal. Following a social call from former editor Bellamy, the Clinton New Era classified his nervous illness as ‘shell shock’: a mental and emotional disorder common to returning soldiers, which today would probably be understood as post traumatic stress disorder. 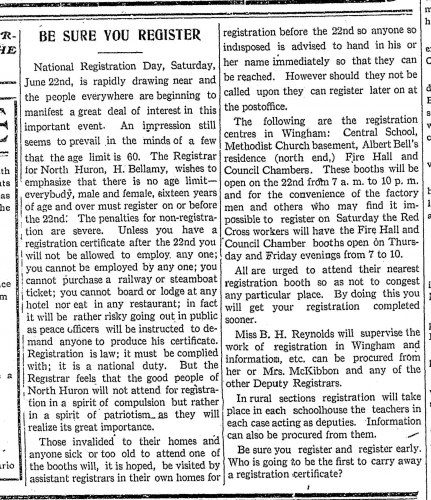 Despite experts’ doubts about his ability to cope with a full-time job, Harry received a temporary government position as North Huron’s Registrar for 1918’s National Registration Day effort. The federal government intended this wartime “man and woman power census” to identify available labour forces for the homefront and overseas by requiring all Canadians over sixteen to register. Nothing in the newspapers suggests that Harry Bellamy returned to printing or publishing on a full-time basis in Dungannon. After the war was over in 1919, Ashfield accepted Harry’s application for the township’s annual printing contract with special consideration to him as a “returned soldier,” but according to an item in The Wingham Advance he later declined the work for the pay offered. There was evidently a vocation that Harry Bellamy now felt more passionately for than journalism, because in May of that year the New Era records that he moved to Toronto to accept a bureaucratic position “in connection with the re-establishment of soldiers.” In 1921, Harry ultimately sold The Dungannon News printing equipment to a buyer from Meaford, and he and wife Annie settled permanently in Toronto.They didn’t entirely disappear from print, however, as local news columns over the next decade continued to note the couple’s visits to friends and family in Huron County. Hot off the Press: Seen in the County Papers opens Nov. 21st at the Huron County Museum! Visit the exhibit to learn more about the stories behind Huron’s historic headlines. 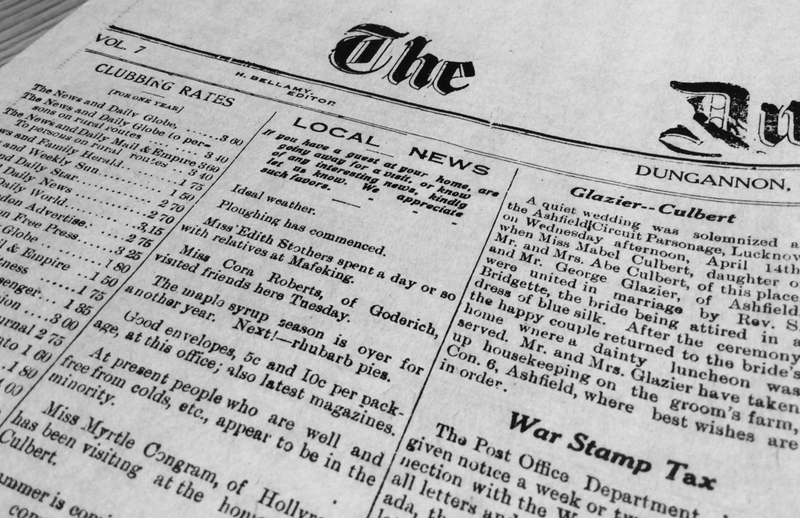 You can browse the newspaper collection from the comfort of home at www.huroncountymuseum.ca/digitized-newspapers. 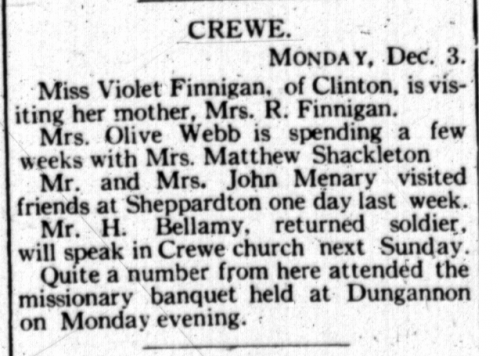 Information for this blog post came from Huron County’s digitized newspapers and Library and Archives Canada’s digitized service records. Treaties & Huron County Two heads are better than one!